Access a library of articles and reports, engage with our video tutorials and training modules, all part of our accredited education programme on different investment sectors and asset classes. We produce articles on a monthly basis covering real assets, social impact, alternative finance and tax efficient investment sectors. We focus on areas that are less well covered by the mainstream media. Sometimes we focus on providing commentary and reaction to breaking news stories or developments in the marketplace. On other occasions we provide detailed, objective analysis of regulatory changes or insightful guides introducing new products, investment sectors or financial planning concepts. Recent articles have covered tax efficient investment through the Enterprise Investment Scheme (EIS), new rules and regulation surrounding crowdfunding and real assets such as silver, farmland and student property. Our articles are short and to the point, and our ideas are presented in a clear and logical format with supporting data. We like to use a lot of tables, charts, diagrams and infographics to help us get complex concepts across to our readers. We have a number of external contributors who provide content on specific concepts and sectors, including Lisa Best who specialises on regulatory and technical content and Steve Williams who focuses on mainstream investment opportunities and passive investment strategies. By subscribing to our articles you will be able to build your knowledge and understanding of these investments and demonstrate to regulators, compliance departments and clients that you have taken a diligent and professional approach to doing business in this sector. Although aimed primarily at financial advisers, we aim to make sure that the information included in these articles is accessible, relevant and valuable to everyone. 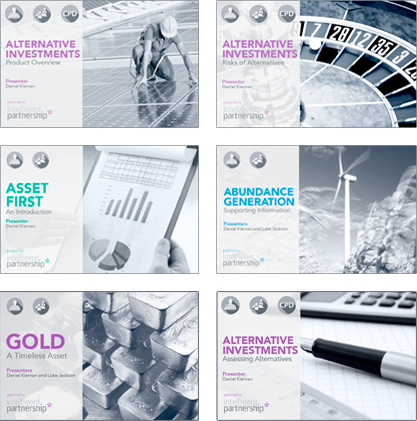 We produce neutral, informative and in-depth reports and research on the four main alternative investment markets. The AiR (Alternative Investment Report) series covers real assets, tax efficient investments and alternative finance. This includes an annual industry report on each market and detailed ad-hoc reports on specific alternative investment sectors and asset classes. Reports are produced by our in-house research team and are peer reviewed externally by financial professionals and market experts. They are aimed at financial advisers, professional intermediaries and sophisticated investors and provide the reader with in-depth knowledge from a retail investment perspective. This is achieved through specific sections covering the latest developments in the market, regulation, distribution, suitability, due diligence, surveys with industry participants and the outlook for the sector. Further to this there is in-depth analysis on the different investment opportunities available, along with information on providers, performance, expected returns, charges and regulatory status. As most alternative investments are not listed on exchanges or even known to the regulator, this provides readers with awareness of the market in one place. All of our reports have been accredited for CPD (Continuing Professional Development) by the Institute of Financial Planning (IFP), the Chartered Insurance Institute (CII) and the Personal Finance Society (PFS). Readers of any AiR report can claim one hour towards their CPD scheme for each hour spent studying the report. Subscribing to our reports allows advisers to enhance their knowledge of some of the less well-covered investment sectors and receive CPD accreditation for doing so. We provide training on alternative investments to advisers, professional intermediaries and other market practitioners. Training is delivered face-to-face or via live interactive webinars. We also post pre-recorded sessions on our website each month which can be easily accessed through our research hub. Accredited Training: All of our training content on generic investment sectors and concepts is accredited by the Institute of Financial Planning (IFP), the Chartered Insurance Institute (CII) and the Personal Finance Society (PFS) for CPD. Advisers can claim CPD whenever they complete a training session. Investment Specific Training: We also provide initial and on-going training to support our model portfolio investment solution and other investment options including social impact investing. This training is not accredited, but will ensure that users are totally confident and up-to-date with the investment products and concepts. We’re also happy to provide this product specific training to non-subscribers who are keen to find out more information about our products. Our training is clear and concise and targets specific learning outcomes. We keep the sessions short and to the point at just 30 minutes long and always share our slides and supporting material with the audience – so you don’t have to make reams of notes. We continue to support you after the event and welcome feedback and follow up questions. The majority of our training is delivered in-house by Daniel Kiernan. We also have a number of industry professionals who specialise in specific sectors and concepts, including Philip Gillett for Crowdfunding and Paul Owen for Sales. We are also happy to provide bespoke, tailored content on request for larger groups who are looking for something specific or a little bit different..
Our videos supplement the more in-depth information we provide elsewhere. 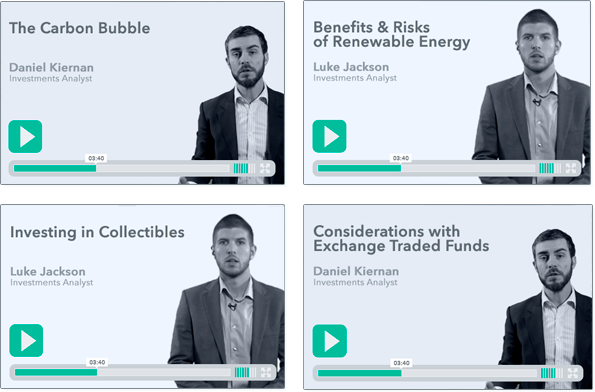 These videos summarise the topics that we cover in our reports and articles, responding to market developments and doing think-pieces to camera on whatever has captured our attention or got us excited. All of these videos are short, clear, logical and easy to understand. They are designed to support the knowledge and understanding you have gleaned from other areas of the research hub. This is also an opportunity for us to showcase presentations and interviews from guest speakers and our annual industry events, such as the Alternative Investment Summit. Guest speakers include David Stevenson from Investors Chronicle and Adventurous Investor, and other widely acclaimed industry professionals including Giles Andrews and Nicola Horlick. Recent topics we have covered include issues with traditional financial services, the concept of ethical investing, active vs passive fund management, benefits and risks of renewable energy investment and a look at some of the more esoteric investment sectors including collectibles.